(Licence # VFT/MA/04792) - Lovely 2 bedroom apartment with large corner balcony looking out to the golf course and mountains. 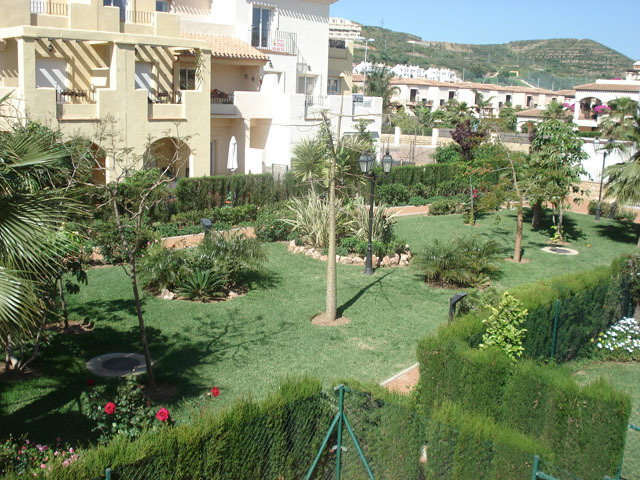 The apartment is very close to the popular La Cala village and beach. Patio doors from the lounge and the main bedroom lead to the balcony. The apartment has video entrance security and is serviced by lifts which are ideal for disabled access. Fully fitted kitchen with granite worktops and state of the art kitchen furnishings. Air conditioning/heating is provided free of charge. Free WiFi. UKTV (limited progs). The apartment is a 2 minute flat walk to the centre of La Cala and 7 minutes to the beach. La Cala is an unspoilt fishing village with plenty of fantastic restaurants and bars and a lovely beach. One of the nicest spots on the coast and being only 20 minutes from Malaga airport. Nice apartment in a good location. Within easy walking distance of all amenities and beach. Easy free parking outside.